Below are some of the more frequently asked questions about our Second Degree Accelerated Program. Select the question you would like the answer to below. Should you have questions beyond these please do contact the Office of Admissions and Recruitment. Nursing is a profession that combines the art of caring and compassion with science and health-related technolo- gies. Successful nursing students need good study habits, excellent critical thinking and problem-solving skills, confidence, determination, and an eagerness to learn. Nurses today have flexibility in their working schedules and more options than ever before about what kind of work they do, where they do it, and when they work. A nursing career is filled with endless personal and professional rewards. Why has this program been established? There are many different educational programs for nursing. 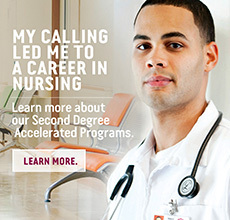 The Second Degree Accelerated Program is designed to admit non-nurse baccalau- reate (or higher) graduates and provide the education necessary to complete the BSN and the qualifications to take the licensing exam to become a Registered Nurse (RN). College graduates with a baccalaureate degree (or higher) who have an interest in and aptitude for a career as a professional nurse may be eligible for this program. Applicants must possess a baccalaureate degree in a field other than nursing and have a recommended cumulative GPA of 3.0 or greater before they can apply. The necessary prerequisite courses must be completed before January 2, 2019. I am a non-immigrant international student studying in the United States. Am I eligible to apply to the Second Degree Accelerated Program? Mount Carmel College of Nursing is not an I-20 granting institution. We can accept international students only if an I-20 granting institution. We can accept international students only if they are Permanent Residents or do not require I-20 documentation. There will be an Orientation in early December for students accepted into the program. Attendance at Orientation is mandatory in order to start the program in January. Financial Aid information is available at http://www.mccn.edu/tuition-and-financial-aid. What is the length of this program? The program is 13 months and begins with the start of Spring Semester (January) each year. The program requires three consecutive terms of full-time study and consists of 84 semester credits (20 courses). A new class will start each January and finish the following year in early February. How is all of the information covered in such a short period of time? Course and nursing clinical sessions are blocked to provide a more efficient method of delivery in a shorter period of time. A typical day consists of eight to ten hours of class time, lab, and/or nursing clinical activities. How can the necessary clinicals be covered in just one year? The program is just over one calendar year [January to early February]. The College has scheduled clinical courses from the sophomore, junior and senior years of the regular pre-licensure curriculum, along with other required courses to offer the program in 13 months. Class, lab and clinical times will vary depending on clinical and lab availability. Students must be flexible for day and evening scheduling. How many hours should I plan for class and clinical activities per week? The accelerated pace of this program will require 40 hours per week in class, lab and clinical. How much study time should I plan for each week? Students should plan for at least 20-30 hours outside of class and clinical time for course assignments and review of class materials. Students must have flexible schedules that will accommodate evening or weekend classes & clinicals. When are the breaks in the program? There are six holidays throughout the program, plus a short break in April and two week breaks in August and Christmas through the New Year. Can I take family vacations during the 13 months of the program? Vacations can only be taken during the scheduled breaks. No. This program is offered only in a face- to-face format. Some components of the program may be enhanced with online learning, and a computer is strongly recom- mended, but the majority of the content is delivered in class, lab & clinicals. Will I need a computer in order to complete the program? Mount Carmel College of Nursing faculty teach all theory courses. Clinical experiences are planned for one of the four Columbus hospitals in the Mount Carmel Health System or local healthcare facilities. Clinical activities have oversight by College faculty, sometimes with involvement of nurse preceptors. Do I have to take two semesters of anatomy and physiology as prerequisites? We have indicated the prerequisite as “Anatomy & Physiology I & II” because that is the format in which Mount Carmel offers these two courses. Many schools teach Anatomy in one term and Physiology in another term. However, in either case you would need two courses in order to cover the entire body systems. If there is more than one choice at your institution, choose the course for science majors. Must I complete the prerequisite courses by the application deadline? No. You may submit your applications to Mount Carmel College of Nursing while in the process of completing prerequi- site courses. You will be asked to communicate to us the prerequisite courses completed and the courses you still need to complete. You are required to have all prerequisites completed by the time you begin the program in January. You can be admitted pending successful completion of all prerequisites maintain- ing a cumulative GPA of 3.0 or greater. How do I know what courses will transfer from my previous degree(s)? It is highly recommended that you request a transcript evaluation prior to applying. Transcript evaluation is available for a $25 fee. Complete the Transcript Evaluation Request form. *Arrange for official college transcripts to be sent to MCCN. The completed evaluation will be e-mailed to you, other- wise Mount Carmel College of Nursing will complete a transfer credit evaluation as part of your application process. What type of equipment will I need to purchase? Students will need to purchase a lab coat, student uniform, College of Nursing uniform patch, stethoscope, blood pressure cuff, calipers, penlight, and wrist watch. Information regarding where to purchase these items will be provided to students after admission to the Program. Are there other program requirements in addition to the course? All students enrolled in the Second Degree Accelerated Program must complete 10 clock hours of Community Service (outside of class hours) in order to meet graduation requirements. The graduation requirement is 128 semester hours. You will complete 84 semester credits at Mount Carmel College of Nursing, plus the prerequisite credit to equal the total 128 required semester hours. Upon completion of the program, Mount Carmel College of Nursing will confer the Bachelor of Science in Nursing (BSN) degree. No. Graduates must pass the licensing exam to become a RN. Oversight for this exam is through the Ohio Board of Nursing. We will provide graduates with details about scheduling the NCLEX-RN exam. Can I work while enrolled in this program? Because of the number of classroom and clinical hours required in the Second Degree Accelerated Program, enrolled students are strongly advised NOT to work, given the rigor associated with completing degree require- ments. Involvement at this accelerated pace (40 hrs/week) will lead to a time commit- ment equivalent to full-time employment. In addition, at least 20-30 hours outside of class and clinical will be spent on course assignments and review of course materials. What happens if I must withdraw from the program for any reason? Only those students who can commit to the 13 months of the program and who are totally serious about finishing with their cohort should start the program. A student unable to continue for any reason will be dropped from the program and considered for placement in the regular undergraduate pre-licensure program. There is no option for re-entry into the Second Degree Accelerated Program. Do you have on-campus residence facilities? For students wishing to live on campus, MCCN has two Student Residence Halls adjacent to the college for easy access to classes and the faculty. The new Halls offer apartment style living, housing four students per unit. Also, students, both commuter and resident, have access to three on campus dining options: the Hospital cafeteria, Wendy’s and Tim Horton’s. How is the five-year requirement for science courses calculated? The 5-year requirement for science courses is calculated from the date classes start for SDAP. If classes start January, 2020, then the course(s) would need to have been taken between January 2015 and January 2020. If course(s) were completed before Jan, 2015, then the course(s) need to be re-taken or proficiency tests must be completed successfully. Proficiency testing is available and can be arranged through Records and Registration. Can I apply before I have earned the degree? Yes. However, you must earn your degree by June of the year you apply. Can I take the prerequisite courses at Mount Carmel? No. Unfortunately we are unable to offer these courses on site. If you are local, you may take these courses at either Columbus State Community College or The Ohio State University. Each school offers transfer equivalents. How can I find out what the equivalents are at these schools? You can download a copy of our transfer matrix from the website. We will accept applications and materials so long as they are postmarked on or before the application deadline. If they arrive after the deadline and are not postmarked appropriately, they will be considered late. Can I work while in this program? Because of the rigors of this program, students are not encouraged to work. However, the College cannot stop a student from seeking employment. Is there any way to have my transcripts reviewed by the evaluator before I apply? Yes. You must complete a preliminary transcript evaluation form. This form can be downloaded from our website. Retake the courses before attending. Schedule a placement exam with our registrar to test out of the course. Each test costs $100. Our registrar will put you in touch with a faculty member who will administer the exam. They can discuss what will be covered. What is the TOEFL and why must I take it? The TOEFL stands for Test of English as a Foreign Language and you must take it if English is not your native language. I am a non-immigrant international student in the United States. Am I eligible to apply? Mount Carmel College of Nursing is not an I-20 granting institution. We can accept international students only if they are Permanent Residence or do not require I-20 documentation. Please check the status of your visa. Applicants must write an essay of 300 words or less on the following topic: As a future nurse, what do you think you will contribute to nursing? My essay is over 300 words. I’ve tried to shorten it, but I’m still over. Is that ok? Students will be notified by email early to late July. Can you tell me over the phone or via e-mail if I have been accepted? Yes. Once you confirm your attendance the Admissions Office will mail you documentation asking for medical history and immunizations. Will there be an orientation for student accepted to the program? Yes. Information about orientation will be given by the Registrar’s Office. Students must earn 126 semester hours to graduate.